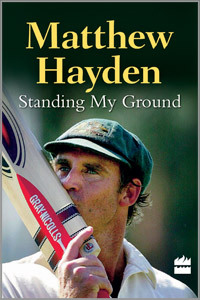 Matthew Hayden’s autobiography, in collaboration with ghost writer Robert Craddock, is a well-documented and easy to read book with every aspect of Hayden’s career and character covered in fair detail and nothing shirked. The book may be slightly surprising in that there are forty-four chapters within the book’s 402 pages but this makes for an easy read with each subject covered concisely without the need for having too many longer chapters. Although there is no firm chronological order, Robert Craddock puts the book together very well and it makes for a book which is difficult to put down. Hayden accepts that there are at times conflicting sides to his character on and off from the field and these aspects are covered in a frank and persuasive way. Like many Australians, the baggy green cap is very significant but, whilst giving good mention to it and the Australian mentality towards winning and their “mateship”, it is not mentioned overly to become the recurring theme of the book. Also like many Australians with other interests outside cricket, Hayden mentions his surfing exploits and cookery ( of which he has brought out a book) and is not shy to mention that one of the best quips which he received as a player from the crowd was to the detriment of his cooking. In a way, Hayden’s cricket career followed a very similar pattern to his great friend and opening partner, Justin Langer: an early unsuccessful Test appearance, a knock on the head during that Test, a struggle to get back into the Australian team and finally a record to be the envy of many whilst all along having other interests outside of cricket and a happy family life to fall back on. The lack of statistics about such a successful career is perhaps a shame but, as Hayden himself admits, he was never as keen as others on statistics so maybe this is the reason. A very good and enjoyable read.